Twelve Days of Doujinshi, Day 5: Dysfunctional Family? COUNT ME IN! 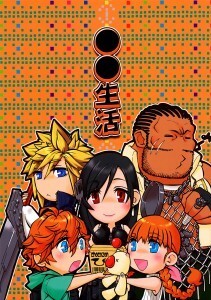 Sometimes I wonder why we don’t do more Final Fantasy VII doujinshi. Then I look at the box I have stashed under my bed chock FULL of the stuff and a sinister grin spreads across my face. Y’all don’t know who you’re dealing with. This doujinshi was edited by c0de_da1sy with help from Melfra, typeset and translated by yours truly, and scanned by Melfra! And with that said, have a FABULOUS NEW YEAR, Y’ALL. Twelve Days of Doujinshi, Day 4: When in doubt, count on Lina Inverse! Twelve Days of Doujinshi, Day 6: When in doubt… Wait a minute, haven’t we already done this? 2 Comments on "Twelve Days of Doujinshi, Day 5: Dysfunctional Family? COUNT ME IN!" Thanks! :O. I really need more ff!